The subject here is not how many reeds grow next to the Danube. 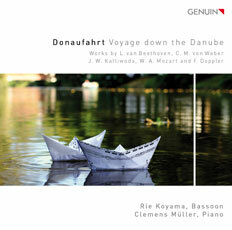 Not is it important whether or not the fabulous bassoonist Rie Koyama dampened her reed in Danube water for her second GENUIN CD after her much-acclaimed Primavera debut. The fact that the prize winner of the German Music Competition and the ARD Competition speaks the musical languages - perfectly - of the former K. and K. states along the blue river is documented by her inspired interpretations of works by Beethoven, Mozart and Doppler, amongst others. Austrian charm and Hungarian verve meet here splendidly. Who wouldn't want to travel with her? "It’s so exciting to encounter a young talent of such brilliance – can’t wait for the next instalment." "L'essenza è chiara fin dall'inizio, dall'attacco del fagotto nella Sonata di Beethoven: il suo gesto è subito netto, preciso, animato, la sonorità è fragrante, pastosa."